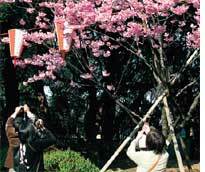 Japan's cherry blossom season, which heralds the start of spring, officially began on March 21--five days ahead of schedule. It is the fourth consecutive year that the flowers have appeared early, said Japan Meteorological Agency, which predicts the bloom dates. Over the past 40 years, the blossoming line--the latitude where trees start flowering on a given day--has shifted 200 km northwards, said the agency. Since a rise in temperature leads cherry trees to bloom, this indicates global temperatures are rising, said the agency. One-third of the more than 800 bird species in the US is endangered, threatened or declining in number due to climate change and habitat loss, said the country's first report on bird population. The US State of Birds said Hawaii, the island of exotic species, has the highest number of endangered birds. At least 10 species have not been seen in the last 40 years and may be extinct. While wetland birds are doing well due to the focus on wetland conservation, those in grasslands are declining due to conversion of their habitat into farmlands. The accelerated pace of urbanization is threatening bird habitats, it said (see 'Privatized rainwater', Down To Earth, April 1-15, 2009). Residents of the Greek capital Athens recently turned a parking lot into a small but much-needed park, practically over one weekend. Athens has one of the lowest ratios of green space per resident in Europe--2.5 square metres. The move was part of a movement against the government's drive for infrastructure projects. Artists, architects and veteran Leftists got together to transform the area into a green space. Greece has no environment ministry; the urban planning ministry is in charge of all related duties. Thirteen officials in China's Henan province have been punished after a chemical company contaminated River Dasha with arsenic. Liu Gaili, a former environmental protection bureau official, was sentenced to two years in prison by a local court. Twelve other officials, including the deputy head of the Minguan county, were either sacked or brought to book. A section of the Dasha was found contaminated by arsenic in August 2008. Water quality tests showed the concentration of arsenic was 900 times the safety standard. Investigations showed the Chengcheng Chemical Co Ltd, a sulphuric acid plant, had been illegally discharging toxic wastewater into the river for a month. To prevent the contaminated water from spreading into the neighbouring areas, experts from the Chinese Academy of Science closed key sluices, built dams and poured chemical agents into the river to treat the water. Tests between November 2008 and March this year showed the water is safe. In an out-of-court settlement, US-based pharma giant Pfizer agreed to pay US $75 million compensation to Nigeria's Kano province over a controversial clinical trial that killed 11 children and caused deformities among others. The amount will go to the children, their families and to settle legal costs incurred by the Kano government. Nigerian authorities alleged Pfizer violated international law by illegally testing its drug Trovafloxacin Mesylate (Trovan) on 200 sick children during a meningitis outbreak in 1996. Eleven died after taking Trovan, while others suffered brain damage, arthritis, blindness, deafness and paralysis. The government had initially demanded US $2.75 billion in compensation and prosecution of staff. But under the settlement, it plans to drop the charges. 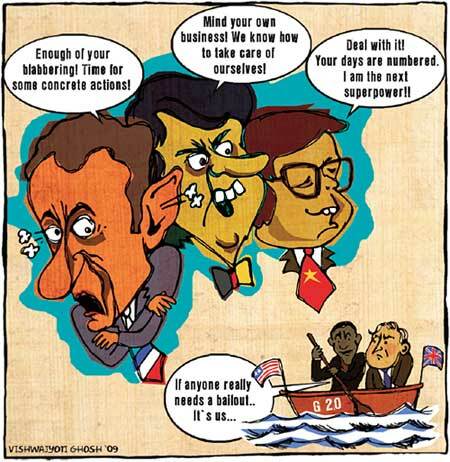 The US does not approve the use of Trovan by children, while the EU has banned the drug (see 'Pfizer will be tried in the US', Down To Earth, February 16-28, 2009). An ice bridge connecting the Wilkins ice shelf to Antarctica broke in the first week of April, allowing an iceberg of the size of a small country to float into the ocean. The 40-km ice bridge was holding the ice shelf to Antarctica's Charcot and Latardy islands. It broke at the narrowest point, just 500 metres wide (see 'Hanging by an ice beam', Down To Earth, April 30, 2008). 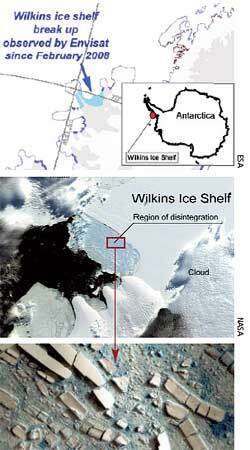 Wilkins is on the southwest Antarctic peninsula, about 1,600 km south of South America, and is the largest of the 10 Antarctic ice shelves to have collapsed or shrunk recently. In the past 50 years, the peninsula has become warmer by 2.5oC, which is far more than the global average, according to the European Space Agency. Scientists say the collapse has exposed land-bound ice sheets behind it to water currents, making them unstable (see 'Expedited meltdown', p36). It was a collective effort to control pests. Residents of the Australian state of Queensland took part in a mass capture of poisonous cane toads on March 28 and caught about 10,000. Dubbed 'toad day out', some toads were donated to scientists, while the rest were euthanized and turned into fertilizer at a local waste management plant. Cane toads were introduced to Australia from Central and South America in 1935 to help control the native cane beetle, a pest for sugarcane farmers, but became pests themselves. They devastated the region's wildlife; crocodiles and snakes fed on the toxic cane toad, inadvertently poisoning themselves. 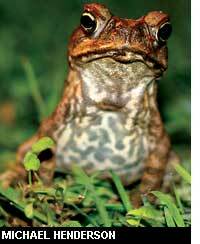 On the 'toad day out', researchers from University of Sydney said an indigenous meat ant could wipe out the cane toad. In the journal Functional Ecology, the researchers said because of certain behavioural traits, the cane toad is more likely to be killed and eaten by meat ants than native frogs. Seven southern African countries saw the worst flooding in about 50 years. Angola and Namibia are the hardest hit where at least 100 people have been killed and 550,000 affected, said the UN office for the coordination of humanitarian affairs (unocha). Namibia declared a state of emergency after the Zambezi river swelled to 7.8 metres--its highest level in 40 years. While neighbouring Zambia, Malawi, Mozambique, Botswana and Madagascar are hit by the floods, incessant rains are likely to worsen Zambia's cholera epidemic. Elizabeth Byrs, spokesperson unocha said the floods would exacerbate the region's food insecurity in 2009 and 2010. The world body has warned of a dire emergency as the heavy rainfall is likely to continue till the end of the rainy season in May. The persistent warmer-than-normal sea surface temperatures over the Indian Ocean are conducive to the formation of tropical disturbances like cyclones, it said. Forests in the developing world will continue to disappear because of small-scale agriculture and other forms of land dependence. Forest cover in developed countries will, however, increase because they no longer depend on land, have better incomes and are a part of the market economy, the UN Food and Agriculture Organization ( fao) said in the State of the World's Forests report released on March 16. Most of the forest loss in Africa, South America and Asia are due to agricultural expansion, biofuel crops, industrialization and population growth. Forest management in these areas will not be easy because of weak government policies. Forest loss would slow down in some Asian and South American countries, which are economically advanced, because people are moving away from agrarian to urban lifestyle. "The fao report is one way of looking at forestry. A nuanced approach would examine if the first world has old growth forests with biodiversity," said Ambuj Sagar, professor of technology and policy at IIT-Delhi. "Who is clearing forests in developing countries, local communities or large companies? If forests are getting cleared for biofuel and food, where are the products going?" asked Sagar.